Traditionally this sector is defined as works by master painters working in Europe from before 1800. It includes Renaissance artists and Dutch Golden Age painters for example. Today Old Master auctions in London and New York will include works by British artists as well as some 19th century works. The catalogue for the painting billed as the ‘Toulouse Caravaggio (1571-1610)’ has been published ahead of its auction in June. A Mannerist bronze after Giambologna and a rediscovered oil sketch by Peter Paul Rubens posted seven-figure sums during the series of sales coinciding with the Salon du Dessin fair in Paris. Discovered in a house in northern France, a rare oil sketch by Peter Paul Rubens created for an important commission in Antwerp has sold for €1.3m (£1.12m). Old Master picture dealer Mark Weiss has agreed an out-of-court settlement with Sotheby’s in the case of a $10m painting the auction house believed to be a forgery. A pair of early George III carved walnut Gainsborough chairs, c.1765, were among the early highlight sales at BADA 2019. Offered from the stand of Richard Courtney in excellent original condition, they sold for a price in the region of £70,000. Paintings by Lindy Guinness reinterpreting the cloud studies of John Constable (1776-1837) go on show at Browse & Darby next week. 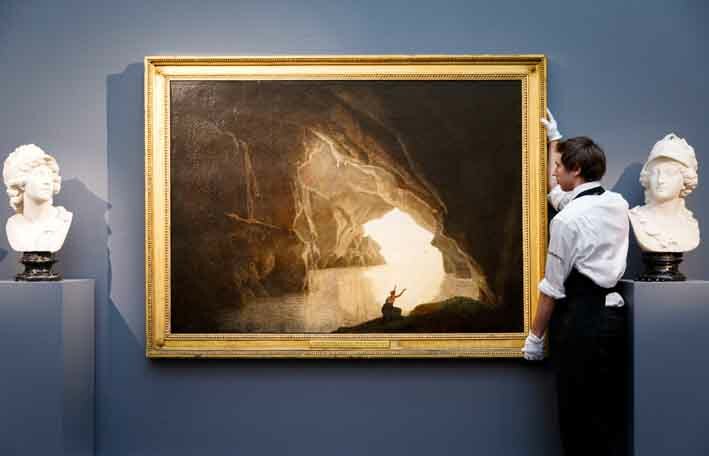 An unpublished work by Joseph Wright of Derby’s is among the further sales reported from this year’s TEFAF Maastricht. A cathedral in Germany has returned a painting that was seized by the Nazis in 1941 to the heirs of its original Jewish owners. The work had entered the collection of Adolf Hitler’s photographer Heinrich Hoffmann and was found among the numerous works he kept in a castle in Bavaria at the end of the Second World War. Some areas of the secondary pictures market march to their own beat, appearing to defy the usual forces that determine value. Ancestral paintings are such a category. Two previously unpublished ink sketches by John Constable (1776 -1837) excelled at Chiswick Auctions’ latest British & European Fine Art sale. Colonial Williamsburg in Virginia has acquired a Joseph Wright of Derby (1734-97) portrait of an Irish veteran of the French and Indian War. The foundation bought it at Sotheby’s Old Master day sale in London in December when it sold for £40,000 plus premium. A rare oil sketch by Peter Paul Rubens created for an important commission in Antwerp has been discovered in a house in northern France and will come up for auction in Lille on March 31. Old Master art dealer Mark Weiss began exhibiting at TEFAF Maastricht in 1988. But for all the important 16th and 17th century portraits Weiss has sold at the Dutch fair since then, few are likely to have made a local connection quite like his gallery’s star object for 2019. A total of 18 phones competed for a rare devotional painting offered by a New York institution at Freeman’s in Philadelphia this week. A marketing drive has begun for the sale of a painting touted as the ‘Toulouse Caravaggio (1571-1610)’. The picture was unveiled in London today ahead of its auction in France in June.